Kerry is continuing to get a lift from the third debate. He has now overcome Bush's 5% lead in Wisconsin and moved a hair ahead there, 48% to 47% according to a Rasmussen poll conducted Oct. 14. Kerry is now once again leading in the electoral college, but neither candidate has the required 270 electoral votes because Florida, Iowa, and New Hampshire are exactly tied. It is noteworthy that Nader is still polling a few percent in most states, even in states where he is not on the ballot. He could make the difference and end up giving Bush 4 more years. 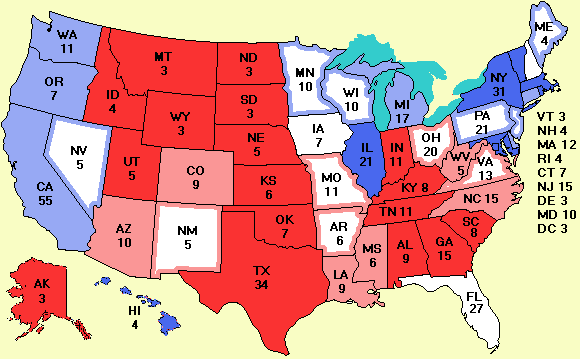 I saw a website, votepair.org, that matches up Nader supporters in swing states with Kerry supporters in solid states (either red or blue) so they can swap votes, with the swing stater voting for Kerry and the solid stater voting for Nader. In physics they would call this "The law of conservation of Naderism." The Republican answer should be a site pairing Bush and Badnarik the same way, but I haven't seen one. Members of Congress do essentially the same thing all the time: when a Democrat goes back home and knows he will miss a vote, he finds a friendly Republican who agrees to abstain. When the Republican is out of town and misses a vote, the Democrat abstains. Speaking of Badnarik, Rasmussen included him in his Wisconsin poll of Oct. 14 and he does as well (1%) as Nader (1%). It is a pity the pollsters don't include him more often. He could get nearly as many votes as Nader. Both the Washington Post and the Louisville Courier-Journal are reporting that the Kentucky Senate race is heating up after incumbent senator Jim Bunning's erratic recent behavior, including reading from a TelePrompTer during a debate and saying that his opponent, Dr. Daniel Mongiardo, looked like one of Saddam's sons. A Garin Hart Yang (D) poll taken Oct. 6-7 shows Bunning's huge lead has melted to 6%. The New York Times reports that various groups are planning to conduct exit polls on election day to monitor irregularities and possible election fraud. It is a sad state of affairs that elections in Florida are now as bad as in Georgia (the country near Russia, not the state). Tom Friedman's column today goes beyond the election and discusses three exceedingly unpleasant issues the next president will have to deal with. First, the baby boomers will be retiring in a few years and Social Security has a $74 trillion liability coming up. Second, as education levels are rising in China and India, not only will low-wage jobs be outsourced there, but high-skill jobs as well. Third, one third of the Arab world is under 15, and as they get older and look for nonexistent jobs, there is going to be trouble. Fortunately, Friedman is realistic enough to realize that neither of the presidential candidates will touch any of these topics with a barge pole, despite the fact that they will have a huge effect on America in the years to come. It would be nice if the media, at least, would raise the issue of how the next president is planning to deal with these colossal issues, instead of focusing on who did what 30 years ago. Finally, we have two new political cartoons today.